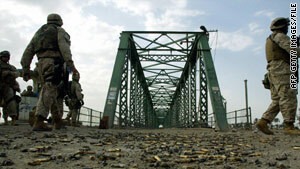 U.S. soldiers in 2004 walk on the bridge where the burned bodies of American contractors were hung. Norfolk, Virginia (CNN) -- Two of three Navy SEALs accused in the alleged assault of an Iraqi suspected of orchestrating the 2004 killing and mutilation of four U.S. contractors in Falluja will have their cases heard in Iraq, a judge ruled Monday. Petty Officer 2nd Class Jonathan Keefe, 25, is charged with dereliction of duty and impeding an official investigation surrounding the Iraqi's detention last September. Petty Officer 1st Class Julio Huertas, 28, faces similar charges. The Iraqi suspect, Ahmed Hashim Abed, complained to investigators he was punched during his detention. The case against the Navy SEALs has sparked outrage that the sailors are being tried at all for handling a suspect in the contractors' murders, one of the most notorious incidents in the Iraq war. The killings got widespread news coverage when the burned bodies of two of the contractors were paraded through the streets of Falluja and hanged from a bridge as their captors cheered. At a preliminary hearing in military court the judge, Cmdr. Tierney Carlos, announced he wants the cases of Keefe and Huertas moved to Camp Victory in Iraq to give them the ability to question the alleged victim in court. "It doesn't make sense to me that the alleged victim is available for deposition and not available for trial," Carlos said in making his ruling for Keefe. "In order to prevent prejudice to the accused, this case should be tried in Iraq." Keefe's attorney had requested that the alleged victim be brought to the United States for questioning. "This deposition will not be a substitute for the alleged victim's appearance," the judge said. Petty Officer 2nd Class Matthew McCabe, the other SEAL, is accused of assaulting the detainee and punching him in the stomach. He faces a special court martial Wednesday. The charges against all three are the equivalent of misdemeanors in civilian court. If found guilty, the SEALs face a maximum sentence of a year in a military prison, demolition to the lowest Navy rank, a cut in pay, and a bad conduct discharge. "Their military careers would be over," one of their attorneys told CNN.